(Waldorf, Md., Nov. 16, 2017) - The Southern Maryland Blue Crabs announced today they have officially removed the “interim” tag on manager James Frisbie and he will return as manager for the 2018 season. 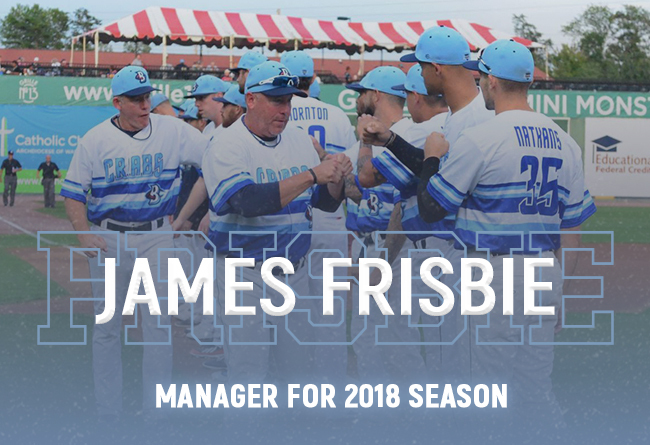 Frisbie began the 2017 season as the Blue Crabs Pitching Coach. He took over the helm in early August and led the team to the First Half Freedom Division Championship. Besides the last two months of the 2017 ALPB season, Frisbie’s previous skipper duties were managing the Texas Air Hogs of the American Association in 2016. In 2013, Frisbie was named the team manager for the Rockford Aviators and was the manager of the 2015 Frontier League All-Star game. As a player, the left-handed pitcher was signed by the Alexandria Aces in the Texas-California League in 1998. Frisbie was on staff with the Rio Grande Valley White Wings, the Jackson Senators of Central Baseball League and with the Chillicothe Paints in the Frontier League. The 2018 Home Opener is April 27, 2018. For more information on the Southern Maryland Blue Crabs, please visit our website at somdbluecrabs.com or call us at 301-638-9788. The Blue Crabs play 140 regular season games in the Atlantic League of Professional Baseball Clubs. The Blue Crabs play at Regency Furniture Stadium in Waldorf, Maryland with affordable family fun. The franchise will begin its 11th season in April 2018. Please call 301-638-9788 or visit http://www.somdbluecrabs.com for more information.